Homeowners who enjoy using fireplaces, wood-burning stoves and open fires have a number of choices when selecting wood. Eucalyptus burns hot, leaves little ash behind and provides a pleasant fragrance. However, there are some problems associated with burning this aromatic wood species that may make it less practical than hardwoods such as oak or ash. Firewood should be seasoned before using so that it will burn evenly and cleanly. Seasoning refers to splitting the wood soon after the tree is cut so that the wood can dry out. Eucalyptus trees have a high oil and water content, so the wood must be split and given enough time to dry out before being burned. However, eucalyptus trees are difficult to split because they tend to twist as they grow, and the fiber is stringy. Eucalyptus has a fresh, distinctive scent that many enjoy in an open fire. However, the aroma of burning eucalyptus has also been described as "medicinal," which can alter the flavor of baked goods and other foods. As a result, eucalyptus is not a wood that most homeowners would choose for a wood-burning stove used for cooking. 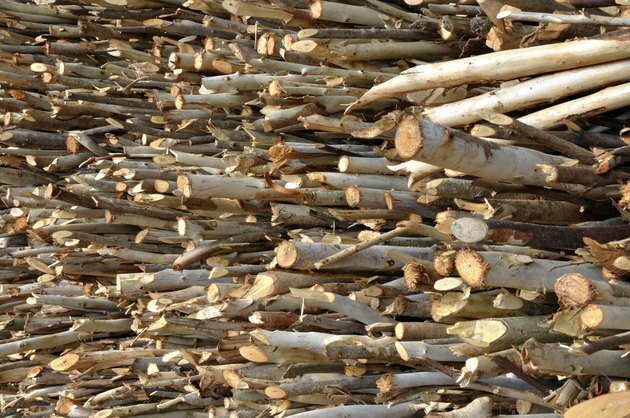 Due to the high oil content of eucalyptus trees, small oil pockets within the logs can cause fires to spark unexpectedly even when the wood has been seasoned. The Napa Communities Firewise Foundation, a California-based nonprofit organization dedicated to mitigating the effects of wildland fires, reports that eucalyptus has been the cause of many fires in the region that have been difficult to control because of the high heat and flying sparks. Wood burning causes a tar-like substance called creosote to build up inside of a chimney. The high oil content of eucalyptus wood accelerates this problem. Eucalyptus creates hard and sticky deposits inside of chimneys that can be difficult to remove. Over time this sticky buildup can result in a chimney fire. Homeowners should have their chimneys professionally cleaned on a regular basis, especially when burning eucalyptus. Can Palo Verde Wood Be Used in an Indoor Fireplace?